Yesterday I accidentally rode up Table Mountain. It was lovely, and awful. 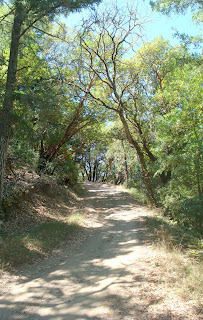 The plan was to ride up Stevens Canyon Road, which turns into the Canyon Trail, right up to Page Mill Road. I started much as I had started the Montebello ride, by driving the bike to Saratoga. I was riding my mountain bike, and I thought that eliminating 20 miles of road riding would be helpful; as it turns out, that was probably unnecessary. I took SR 9 into the mountains, and as in the Montebello ride I went up Pierce's short, steep hill, then climbed up Mt. Eden Road. Temperature makes such a huge difference for me. That previous ride was very hot, and I had to rest on Mt. Eden Road. Yesterday was pleasant, and the little ramps, steep as they might be, were no challenge. Looking south from Mt Eden Road. Stevens Canyon Road runs along the Stevens Creek reservoir, carrying mining and recreational traffic (odd fact for the day: Stevens Creek was named after Elijah Stephens, not Stevens). By the time it meets up with Mt. Eden Road traffic is much lighter and it enters a thickly wooded area. 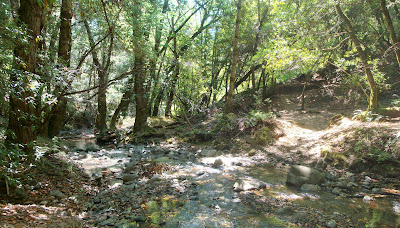 The road is shady and quiet, apart from the water rushing in the creek. Lots of water for this late in the season, come to think of it. The road climbs, but only very slightly -- less than a 3% grade. Along the way it transitions from two lanes to one and a half, and crosses lots of bridges. Toward the top of the road there are two construction areas with single-lane bridges. The road finally meets a gate, but otherwise continues on as before. 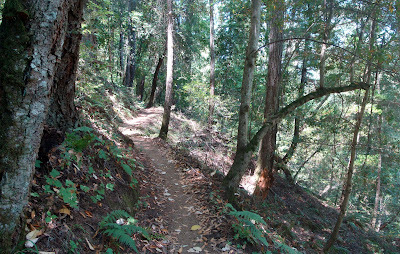 Gradually the pavement disappears, and later the fire road gives up and becomes a single track running along (and occasionally through) the creek. Through this section the trail is still quite tame. It has its little hills, but its still only gradually gaining elevation, and apart from the crossings there were no parts that struck me as technically challenging. Then, something went wrong. I took a wrong turn. Looking back, I think I remember where it must have been, but of course I can't be sure. There are lots of places where the trail briefly splits for various reasons, and I mistook the fork for one of those diversions. If there was a sign, I obviously didn't see it. Although I didn't realize it yet, I found myself on the Table Mountain Trail, and the character of the trail changed almost immediately. First, one is obligated to cross the stream again, then climb the hill on the opposite side. This was the first of a number of small hills that I had to walk the bike up. I watched a few fellow cyclists negotiate some of these little ramps with their ridges, loose rock and exposed roots, and while I tried a few of them, I walked up the majority with no injury to my ego. The Table Mountain Trail climbs about 600 feet in a little over a mile. It runs through beautiful country, but it's a little too technical for me, so it's hard to enjoy as a ride. Near the top it finally dawned on me that the road was turning away toward the south, not maintaining the northwesterly path of the Canyon Trail. I consulted a GPS app on my phone and realized my mistake. At this point I was at about 1700 feet, so turning back to the intersection would mean giving up 500 feet, and on a fairly technical trail to boot. Looking at the park map, it turns out that riding downhill would have been against the rules, too, but I don't recall seeing any signs out there. In any case, I pressed on. The Table Mountain Trail ends at an intersection with the Charcoal Road, where lots of hikers were resting. After struggling on the trail so far, I was amused to learn from some fellow bikers that Charcoal Road was the harder section. They described it as twenty minutes of first-gear grinding, and I offered that their twenty minutes would take me an hour. I was right, down to the minute. Charcoal Road is only about a mile long, but climbs at about 13%. It's steeper than the Kennedy Trail. For me that means lots of little rests at the top of the ramps to keep my heart rate in check, and in this case a longer rest in the middle to eat some lunch. Toward the top one is rewarded with a view over a huge section of the valley. Looking east you can see past the Montebello Road ridge to Mount Hamilton. Looking south you can see past El Sereno to Mount Umunhum. In between you can make out the sprawl of San Jose. by Montebello Road. The Ridge Vineyard is visible on top. Charcoal Road comes to a merciful end at Skyline Road and 2550 feet of elevation. At this point, I've actually returned to my original plan, or at least one version of it. In effect I've replaced perhaps 8 miles of gentle climbing with 2 miles of scrambling, but it's all an adventure. It's time to head back to the car, but since this is Skyline, there's a little more climbing to be done. 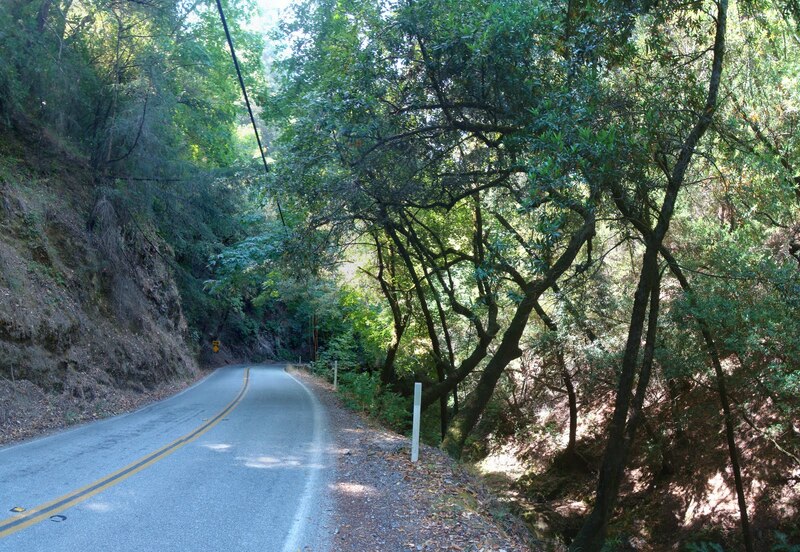 As I head southeast toward Route 9 the road generally climbs, reaching the high point of this ride at about 2650 feet just before Saratoga Gap. Along the way Skyline offers views toward the south and west, where low clouds covered the coast and the ocean. After a couple of sodas from the hot dog guy at Saratoga Gap, I coasted down into Saratoga and my car. The Garmin tells me that it was only about 22 miles. It gave me 3300 feet of climbing, but I think part of that was because it thought I dropped quite suddenly to -80 feet on Stevens Canyon Road. 2800 feet of climbing would be more realistic. I suppose I'll have to go back to pick up the Canyon Trail one of these days. As for Table Mountain, I'm happy to have seen it and had a very good time, but I don't know that I'll go there again anytime soon.